Looking for a quality new car, from a brand that’s been in the automotive game for years? Then you better ask yourself, “Where is the closest Chevy dealer near me?” And then get yourself over there immediately. Why Chevy? Well for starters, the brand as a whole won more J.D. Power Initial Quality Awards for their vehicles than any other brand in 2016. Those awards mean if you pick a new Chevy model for 2017, you’re getting quality right from the get-go. Also, you have some really great models to choose from when you go with Chevy. The Cruze, Silverado, Colorado, and Camaro are all great picks if you’re looking for a vehicle that’s a leader — not a follower — in those car classes. While they all have many great points that make them unique, all Chevrolet cars are designed and engineered with safety in mind. Everything from the safety cage that surrounds the cabin to driver assist features have all been fine-tuned. Not to mention, they’ve added Teen Driver Technology standard on all their models. The year of 2016 will be known to Chevy as a triumphant year. Receiving more J.D. Power Initial Quality awards than any other brand is no small feat because doing requires passing J.D. Power’s Initial Quality Study. What does this study entail? It looks at any issues that consumers might have experienced within the first 90 days of new car ownership. To do this, they measured the true quality of a model by analyzing problems reported in design or mechanical quality per 100 vehicles. Which Chevy models received the award in 2016? The Spark, Equinox, Tahoe, Silverado 1500, and Silverado HD. How Does That Relate to Buying New in 2017? Many of you are probably asking yourself how this relates to buying a new Chevrolet model in 2017. This award is for 2016 models after all, and was only awarded to five (not all) of Chevrolet’s new models. However, that’s about half of Chevrolet’s model lineup. Chances are, the other models from 2016 are still quality, reliable choices. Furthermore, automakers tend to find a winning formula then run with it. So even if drastic changes were made to the five models mentioned above, we’re still confident that they’ll receive the 2017 Initial Quality Award as well. More importantly, it shows Chevrolet cares about providing consumers with quality vehicles. Between the Silverado still being the longest lasting pickup truck on the road, and receiving more J.D. Power Initial Quality Awards than any other brand in 2016, clearly this is the brand to trust if you want a reliable and long-lasting new vehicle. Even if the model you’re buying is one of their new 2017 models. Speaking of 2017 models, while these only represent four of Chevrolet’s 2017 model lineup, these models have undoubtedly gotten better year-after-year. The Cruze is now globally outselling the Silverado, for example, while the Colorado is the only pickup in the midsize segment to offer a diesel engine that gives it best-in-class fuel-efficiency. The Camaro is the fastest it’s ever been, and the Silverado 1500 continues to be the best selling Chevrolet model in America. In other words, if you’re unsure of what to get for a Chevrolet, these four are a good place to start. Looking for a compact, zippy, and fuel-efficient ride that’s loaded with technology? Then the 2017 Chevy Cruze is for you. Its spirited performance comes courtesy of a 1.4-liter four-cylinder engine. 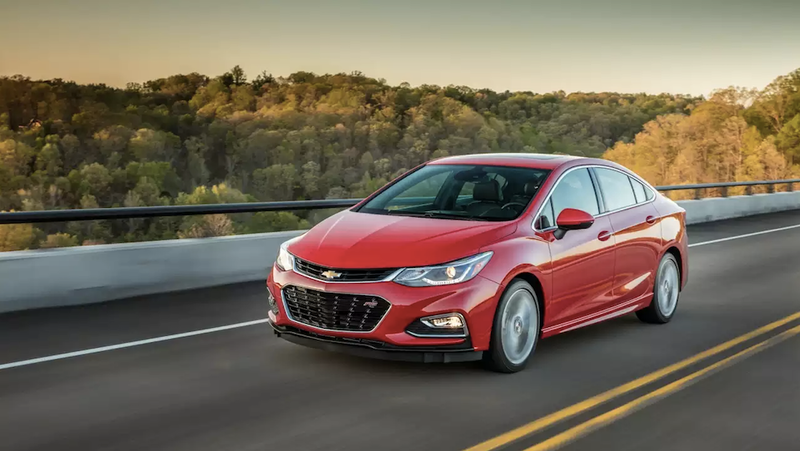 This engine produces 153 horsepower/177 lb.-ft. of torque, and gives the Cruze a fuel-efficiency rating of 28 mpg city/39 mpg highway when the manual transmission is equipped. Looking to squeeze more fuel-efficiency out of it? Then get the automatic transmission, and enjoy 30 mpg city/40 mpg highway. While you’re cruising the roadways in stylish efficiency, it’s important that you have the tech to enhance your style! With the 7-inch MyLink touchscreen, you’ll have access to all your favorite apps on your phone with either your Apple CarPlay or Android Auto connection. In order to keep your cellular data charges low, make sure to take advantage of the built-in 4G LTE WiFi hotspot you’ll find in the Cruze and most other Chevrolet models. Also, the Cruze is available as a hatchback model. With three different engine options, capability is the name of the game when it comes to the Silverado 1500. The base engine is a 4.3-liter EcoTec3 V6 engine that produces 284 horsepower and a best-in-class 305 lb.-ft. of torque. With it, you’ll see returns of 18 mpg city/24 mpg highway, and a towing capacity of 7,600 pounds when properly equipped. The second engine is a 5.3-liter V8 engine that produces 355 horsepower and 383 lb.-ft. of torque, generating a towing capacity of 11,100 pounds. This engine also received best-in-class fuel-efficiency, returning a surprising 16 mpg city/23 mpg highway. A 6.2-liter V8 engine is the largest and most powerful engine choice offered on the 2017 Silverado 1500. It produces 420 horsepower and 460 lb.-ft. of torque, and gets a 12,500 pound towing capacity, which is considered best-in-class. Maybe you don’t need that much power from your Chevy truck. If that’s the case, then look at the 2017 Colorado. It’s a midsize pickup (not full-size like the Silverado), and offers the only diesel engine found in the class. This engine is a 2.8-liter I-4 Duramax turbo-diesel engine that produces 181 horsepower and 369 lb.-ft. of torque. It’s able to return up to 22 mpg city/31 mpg highway, and gives the Colorado a towing capacity of 7,700 pounds. With the Camaro, you’re looking at advanced performance technology that’s been built on 50 years of the same nameplate. If you really want to see what this vehicle can do, then you’ll want to look into the Camaro SS (Super Sport). With its 6.2-liter LT1 V8 engine and 455 horsepower and matching 455 lb.-ft. of torque, this vehicle can do a 0-60 mpg sprint in 3.9 seconds. Not only is that one second quicker than the Mustang, but it’s the fastest street-legal Camaro ever produced. Regardless of which vehicle you buy, Chevrolet has made it a point in 2017 to make all drivers and passengers as safe as possible. It all revolves around this three-pronged idea when it comes to safety: prevent, protect, and respond. In order to prevent crashes, Chevrolet models can be equipped with advanced driver assist features that warn the driver of a potentially dangerous scenario. Such as providing an audible warning when drifting out of your lane unintentionally, and gently nudging the steering wheel if you are unable to correct it yourself. Or, driver assists functions that protect against rear and frontal collisions. For protection, there’s no replacement for a good high-strength steel safety cage and airbags. Which is exactly what each Chevrolet vehicle has been designed with, along with front and rear crumple zones, of course. Reacting swiftly after a collision has occurred is important. Decisive action can mean the difference between life or death. So, what happens if you can’t call 911? That’s where OnStar Automatic Crash Response comes into play. After the program’s sensors detect a collision, an OnStar Advisor is immediately connected to your car. If you are unable to call emergency services yourself, the Advisor will send them to your location via GPS tracking. That way regardless of what happens, you can rest easy knowing you have help on the way.